And here we go, finally, with the last day of the 2014 Monsters of Rock Cruise: Escape to Monster Island which consisted of a full day of rocking out in the open waters. After breakfast in the buffet I enjoyed the brilliant sunshine on the pool deck and some breakfast beverages with friends new and old. Everything today was thrown to the wind. The schedule was once again jam packed with rock concerts and special events but for me, aside from my main goal of catching the final Tyketto performance, the idea was just to go with the flow (and burn through the rather massive amount of drink tickets that I had remaining). As my drinking vessel for the day I broke out my 1983 Metal Health Rock Cup. A convenience store in Canada had produced this collector cup, provided with the purchase of a slushie beverage, your choice of Quiet Riot, Huey Lewis, Men At Work and more. This thin plastic cup had survived since then in my collection of junk and was perfect for today's second Quiet Riot show on the boat. Two friends from the "EH" Team approached as I sampled from my QR cup and enjoying the sun with some fellow cruisers, thrusting a book in front of me and asking if that was me as they pointed to a spot in the photo. The book that they held was the cruise memory book from 2013's voyage containing photos from that cruise and yes, it was indeed me they were pointing out. 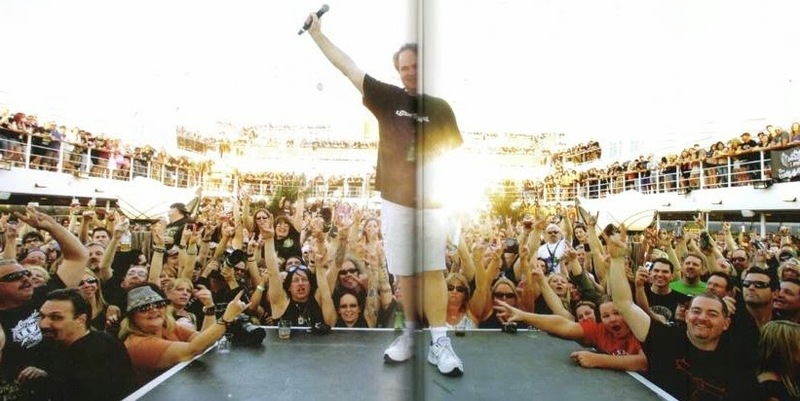 At the sail away concert held by Tesla everyone is to wear a black t-shirt and the cruise takes a "blackout" photo looking out from the stage. I guess I hadn't had time to return to my cabin to change and therefore caused a little inadvertent Decibel Geek promo....lol. Well now I have to buy the damn book don't I and I even autographed someone's! bassist), Minoru Niihara (Loudness vocalist), Roxy Petrucci and Janet Gardner (Vixen drums and vocalist) and Nick Douglas (Doro bassist). When I told Janet that I was looking forward to seeing them in Toronto she immediately replied "At The Rockpile right? ", impressing me that she remembered the name of our beloved little Toronto rock club. several occasions). Great White got under way and we rocked out in the sunshine near the back of the pool deck chatting and spotting more artists. Front man Terry Illous came on stage decked out in a red Canada t-shirt as they opened with "Shot in the Dark". "Lady Red Light", "(I've Got) Something For You", "House of Broken Love", "Desert Moon", "Can't Shake It", "Rock Me" and "Once Bitten Twice Shy" all graced the set list along with "Save Your Love" for which they were joined on stage by Gabbie Rae. Just 15 years of age Gabbie Rae was added to the cruise roster late in the game and had many cruisers talking about her fantastic voice. I had not been able to catch her performances yet aside from this one, but I would suspect from her popularity that she will be returning next year and she's certainly on my "hit list" so to speak. My friend returned to the group from his exploratory mission into the burst water pipe looking a little forlorn. Yes that's right, today is April first and he'd been had in an April Fool's joke, chin up my friend we've a full day of rockin' ahead of us! Campbell on my return, "Lay Your Body Down", "Standing Alone", "Some Kind of Wonderful" and "Forever Young" wrapped up another wicked show from Tyketto. For this show the crowd seemed thicker no doubt due in part to the buzz created after their first stellar performance. The crowd was also peppered with several of Tyketto's peer artists wanting to witness the phenomenon I imagine. 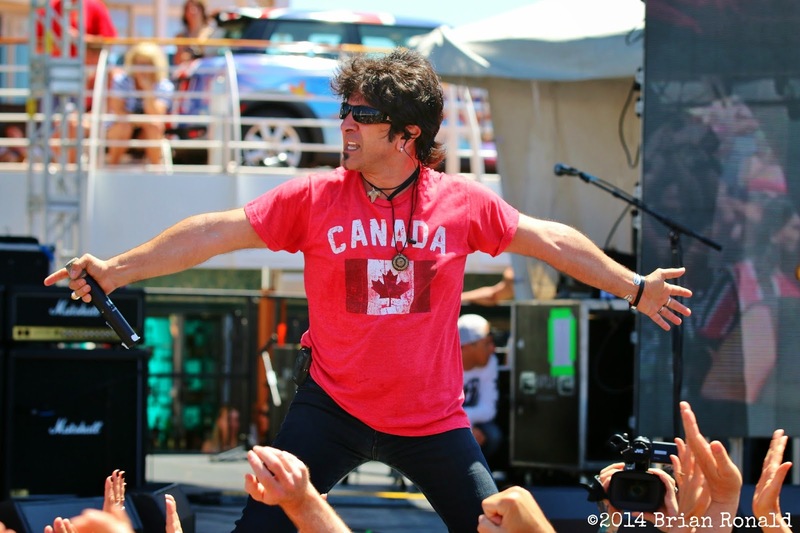 When I saw their first performance it was only the third live act that I'd seen aboard 2014's Monsters of Rock Cruise at the time and I then and there called it "The Best Show on the Boat" and I hold true to that statement on this last day of our voyage. Realizing that the band were coming out to greet the fans and sign merchandise I rushed back up to my cabin to retrieve the Tyketto DVD that I'd purchased on board immediately after the first show. I was able to have keyboardist Ged Rylands, bassist Jimi Kennedy and vocalist Danny Vaughn autograph my DVD, a photo with Danny and a chance to tell them all that they were the best show on the boat. 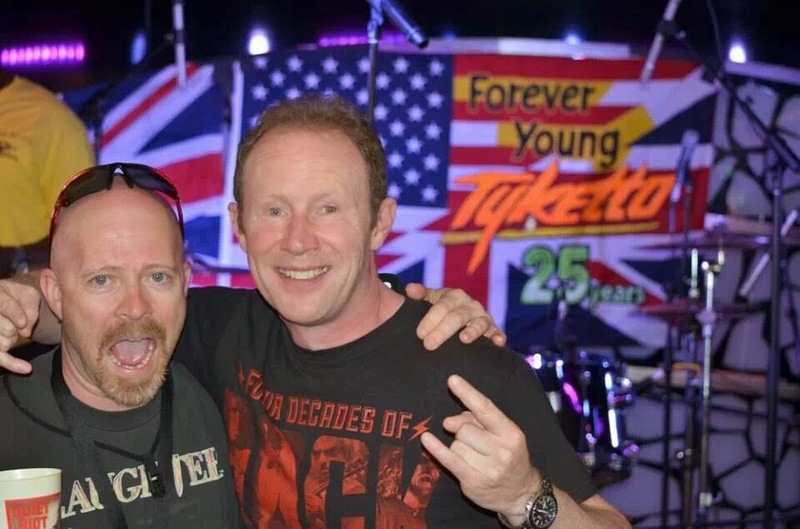 I seriously look forward to the next opportunity to see the live Tyketto experience! large group shot of some of the audience took place. I noticed Frankie Banali entering the lounge and I approached him displaying my choice of drinking vessel for the day. He responded with a rather surprised "What the hell is that?" as I explained the cup's original purpose and history. A convenience store in Canada had offered a selection of "Rock Cups" with the purchase of a large slushie drink back in 1983. The choices of cups were Men At Work's Business As Usual, Huey Lewis' Sports and Quiet Riot's Metal Health among others. On the back side of the cups were the band members and their birthdays along with a short blurb on the band or album. Saying he'd never seen anything like that before he happily posed for a shot of him and I with the cup. After dropping the DVD back in the cabin I made my way up the stairs on a trail to the buffet and some sustenance to soak up the already over indulged evils of the Quiet Riot cup. On the very first cruise in 2012 I had abandoned waiting for the elevators as they are often slow to arrive and crowded, plus I could use the workout that the stairs offered and it's quicker to get from place to place. On this occasion I'm sure glad that I did! As I emerged onto the pool deck/buffet level I was greeted by Ron Keel with an acoustic guitar surrounded by cruisers in the small lobby space between the elevators and the stairs. My memory is a little fuzzy but I'm pretty sure that he was playing KISS' "Hard Luck Woman" as I crested the stairs and onto the scene. A gentleman with Ron explained to me that he had wanted to do elevator karaoke and just ride up and down singing for the patrons using the elevator, but it had gotten too hot in there. I'm glad that it did or I might have missed this truly unique experience that could only take place on MORC! After "Because the Night" Ron graciously posed for a photo with my damn near completed Keel portion of my tattoo that he saw in it's infancy at last year's awesome day with Keel (The Meister's "Right to Rock" with Keel). Before I got to the buffet it was again time to refuel the Quiet Riot cup and a chance meeting with Terry Illous. I asked Terry why the Canada shirt and he explained that he loved Canada and had many friends there, a very pleasant person to talk to I wished him well and thanked him for his music. Arriving in the buffet I joined some other "EH" Teamers and wolfed down some of the better than past cruises lunch fare. Our conversation, as always aboard ship, consisted mostly of what shows we had seen, experiences we had had and what we were planning for later in the day. Some good laughs with new friends and I'm looking forward to making The "EH" Team bigger and better for 2015! Time now to join the huge cattle herding line for the meet & greet. I don't usually attend these events as I prefer the impromptu encounters around the ship where you have more of a chance to chat and offer to purchase a drink even, but the one person that I had wanted to meet more than any other aboard this year was Doro Pesch. Although I had seen Nick Douglas and Johnny Dee I had not seen her around and was therefore forced into the meet & greet session. 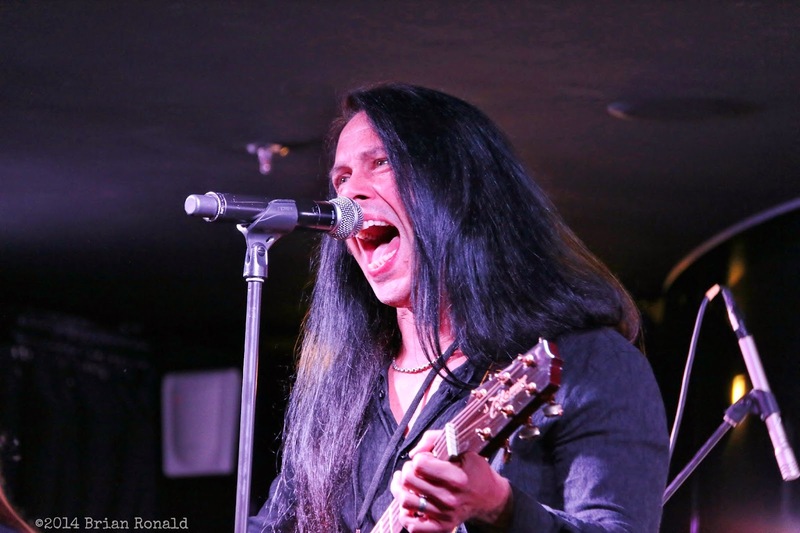 There were six bands grouped into this event with Dangerous Toys, Vixen, KIX, Winger and Dio Disciples joining Doro. While a friend and I waited in line under the scorching rays of the caribean sun chatting with fellow cruisers, he deemed it time to replenish our fluid supply. Right then and there my heart sank! I had left my Quiet Riot cup in the buffet during the lunch experience! The thing had survived in my possession since 1983, but now has become a casualty of the Monsters of Rock Cruise and I only hope that some fellow cruiser found it and can enjoy the cup rather than it going into the garbage by a buffet worker. At least it was showcased in a photo with Frankie Banali, its purpose served I shed no tears for my cup. the Doro and Warlock names appearing in my tattoo, let her know that I had been waiting since 1986 to meet her and thanked her for playing on the cruise. After asking where I was from she said that they hoped to be back in Toronto soon. The Vixen ladies were also very friendly and once again I can't wait for their Toronto show and hopefully a chance to sit down with one or more of them for an interview even. KIX, Winger and Dio Disciples looked less into it which I can certainly understand after they'd been standing there for a long time already, but they were all smiles when the flash went off. For all my moaning and groaning, these meet & greets are actually pretty fun. Losing my friend as he went another direction, I was off to Femme Fatale's set in the Black & White Lounge, pausing on the way for a selfie photo with the great bassist Billy Sheehan. A ton of folks are touting the virtues of the Winery Dogs album, but I personally can't grasp it. With the star power in that outfit this record should surely be the greatest thing that I've ever heard, but it just isn't in my mind, although I'd certainly never tell the artists that. All three in the band Richie Kotzen, Mike Portnoy and Billy Sheehan have been involved in some of the best albums in my collection and my respect for each goes without saying. I'll keep trying to get into the record when I return home, but I make no promises. remainder of that Femme Fatale record with "Touch & Go", "Cradle's Rockin'", "Rebel", "If", "Heat The Fire", "Fortune & Fame" (my personal favorite Femme track, that they only played live for the first time at the other show two nights ago) and "Waiting For the Big One". The final song of their set was a cover of KISS" "Lick It Up", meaning that I had missed the songs "Falling In & Out Of Love" and "My Baby's Gun". During "Lick It Up" keyboardist Katt Scarlett waved me to join her on stage to sing with the band as the rest of the members had done with other crowd members. I politely (maybe drunkenly) waved no thanks (I thought I was just doing everyone a service as I'm rather tone deaf and therefore nobody wants to hear me sing), but she insisted and so I relented. It was seriously a lot of fun up there singing one of my favorite 80's era KISS songs and I offer a special thanks to Katt and Femme Fatale for making my cruise all that much more special (hopefully I didn't damage anyone's ear drums). I haven't had the time as of yet to search, but I'm hoping that there may even be some You-tube footage of the event. Rockin' on stage with Katt Scarlett and Femme Fatale for KISS' "Lick It Up"
My attempt to make it back up to the pool deck to try and catch the end of Quiet Riot's second show was thwarted as I stopped to grab some drinks and photos with friends. I also ran into Loudness drummer Masayuki Suzuki, who I'm not sure understood a word as I tried to say awesome shows and looking forward to the new album. He definitely got the gist when I held up the camera though! I did however manage to secure bass maestro Chuck Wright for a photo of him pointing at the Quiet Riot portion of my tattoo! After some laughs there and loosely listening to the raffle draw for the Harley Davidson Motorcycle, which I didn't win, it was down into the depths once more for the KiLLeR DWaRfS third event of the cruise. 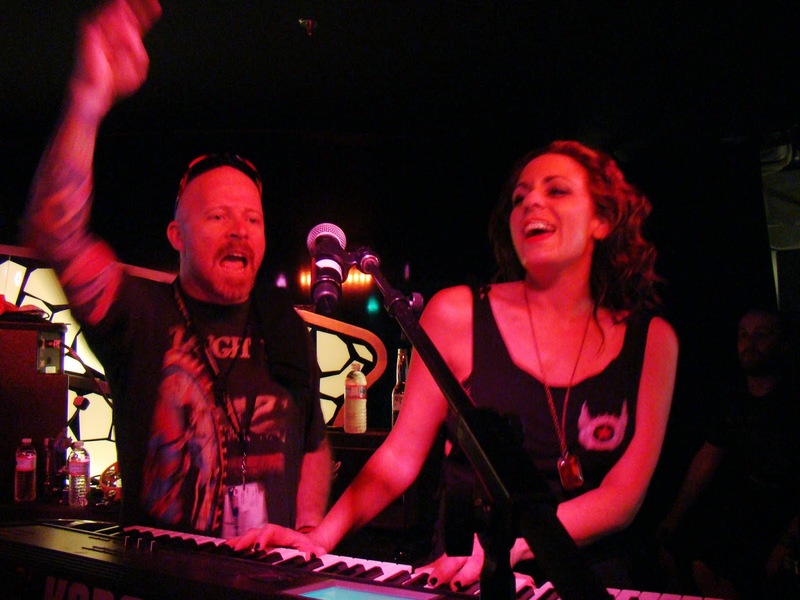 I planted myself up front for the show next to fellow Decibel Geek and first time cruiser Kate Campbell near bassist Johnny DWaRf, who was sporting his "EH" Team shirt for the occasion. The DWaRfS rocked the place with songs like "Comin' Through", "Hard Luck Town", "Last Laugh", "Driftin' Back", "Union of Pride", "Start @ One", "Stand Tall" and "Keep the Spirit Alive" among others. Not one to be contained on this tiny little stage in the Black & White Lounge, at one point Russ had entered the crowd, singing as he circulated the entire place. Looking around at that point I also noticed once again Janis Tanaka, bassist for Femme Fatale, in the audience. Seems that she's at every show that I am, maybe she's stalking me...lol. How it transpired I'm not exactly sure but a full tray of tequila shots purchased by a friend of Kate and I's made it's way to the stage for the band at another point in the show, but one of the highlights for Kate and I was the team Canada shirt. Today aboard the Monsters of Rock Cruise was themed "Sports Night" where cruisers are encouraged to support their favorite sports team with shirts, hats and so forth. Kate had worn her Team Canada hockey jersey and brought a second one which made it's way onto the stage for Russ to don during the final songs of the set. No lies be told, the beverage intake was taking it's toll on my memory by this point as I hit up the Golden Acoustic Lounge for a little of Vixen's set. Not being a particular fan of acoustical performances personally, I lingered for only "Edge of a Broken Heart" and "Cryin'" before moseying forward and back to the fresh sea air offered by the pool deck. I vaguely remember being back in the Black & White Lounge for a little of Red Dragon Cartel's second show and other than that bits and pieces of partying on the pool deck with fellow cruisers and artists until the wee hours of the morning. I do remember talking to Autograph's Randy Rand and I really look forward to seeing them again in Toronto May 10, 2014. Well, that basically ends the 2014 Monsters of Rock Cruise: Escape to Monster Island for The Meister. Once again, for the third year in a row, surpassing my expectations and creating lifetime memories. The folks at MORC and On The Blue presented another awesome experience and I take this moment to thank them, from creator Larry Morand, to Mery and Susan in the office, to all the crew involved in this massive project. All of the bands that I saw brought their performances to another level and I can't wait to see what 2015's cruise holds in store for The Meister. Will I see you there?